Combine the butter and sugar in the bowl of an electric mixer and beat on medium speed until light and fluffy. Beat in eggs, one at a time. Beat in the pumpkin and vanilla. Whisk together the flour, baking powder, baking soda, pumpkin pie spice and salt. Add dry ingredients to the butter mixture and beat on low speed until smooth. Drop onto cookie sheet by rounded tablespoonfuls to make 24 cookies. Bake until springy to the touch (about 12 to 15 minutes). Cool completely on a wire rack. 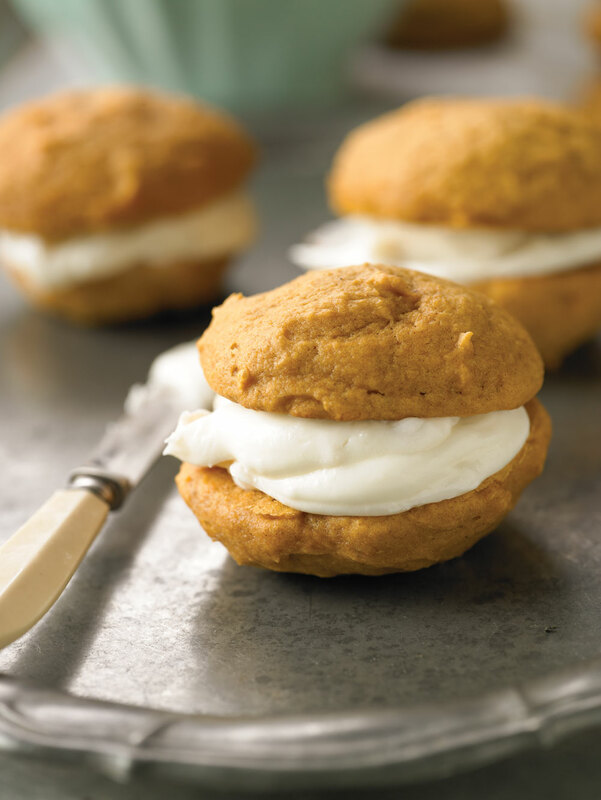 Ginger Cheese filling: Using an electric mixer, combine 6 tablespoons butter and 4 ounces cream cheese on medium-high speed until blended. Reduce speed to low and beat in 11/2 cups confectioner’s sugar and 3 tablespoons minced crystallized ginger. Beat until fluffy (about 2 minutes). Spread the flat sides of half the cookies with the filling, top with the remaining cookies and refrigerate. Makes 12 servings.